Scientists have located the first known fluorescent frog in the Amazon. Poka-dot tree frogs are an unremarkable brown-green with reddish spots in daylight, but glow a bright blue-green under ultraviolet light. 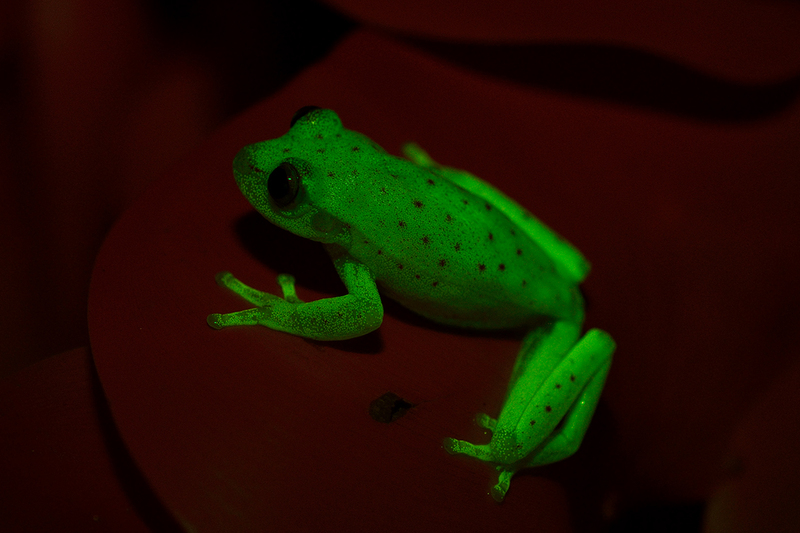 [photo credit: New Scientist] Researchers at the Natural Science Museum in Buenos Aires discovered the fluorescence while studying the frog's pigmentation. Their discovery is reported in Proceedings of the National Academy of Sciences, 10.1073/pnas.1701053114, Fluorescence increases the frog's visibility at dusk by 30% and is thought to play a role in communication since the fluorescent compounds in the frog's skin emit light frequencies the frogs can detect visually. This particular characteristic is known in other species (corals, scorpions and parrots), but no one has thought to look for it before in the world's 5000 frog species. It's unlikely that the poka-dot is the only one that shines.